Where do designers find all of those great images you see them use in their projects? It's not an industry secret, but we understand that sometimes it can feel like one! With websites and digital technology its become so much easier to create your own online advertising in a matter of a seconds. The real question is, how do you create high quality designs that represent your business or brand? Stock Photo Agencies. And the good news is there's a lot of cheap stock photo agencies you can use. For years designers have used Stock Photography Agencies to help them fill their designs. It's one of the fastest and cheapest ways to build high quality designs and find images to show your brand off in the best possible way. Here in 2017 the demand for stock media is stronger than ever and shows no signs of letting up, so lets find out exactly what it is that Stock Photo Agencies do. What Do Stock Photo Agencies Do? 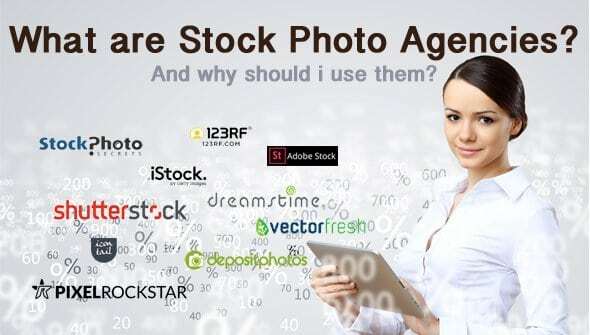 Stock photo agencies can be thought of as giant libraries, they collect and curate images, photos and other media from the artists and then sell the rights to this media on to the thousands of designers who will go on to use them in their designs. This business format is a win-win for the contributors who don't have to spend precious time searching out clients of their own, it's also great for the buyers who don't have to search through thousands of artist websites looking for that specific image they want. Stock Photo Agencies are a market place that help to bring all of this together under one digital roof. Call it a one stop shop, call it a market place, the bottom line is Stock Photo Agencies are the perfect way for you to find images and videos and for the contributors to showcase their art right in front of you. Why Use a Stock Photo Agency for Digital Media? Stock photo agencies focus on 3 main pillars, fast searching, good pricing and the legal rights. By using a Stock Photo Agency, you are assured that you have the legal right to use this media in your work as you purchase a license from the Stock Photo Agency that supplied the media to you. Taking photo's online without first making sure you have a right to use it can land you in a mountain of legal troubles and bypassing this issue for the few cents it costs to purchase a legal license just makes sense. Here you have a list of the top 10 stock photo agencies you must know, the ones you should definitely consider if you're ready to buy cheap stock photos to boost up your designs and brand. These companies are reliable, serious, and they offer a great service. Our very own stock photo agency, StockPhotoSecrets Shop has the best plans and services for small-to-medium budgets. Our offers are specifically tailored for those who need lots of high quality images but cannot invest large amounts to get them. From our Monthly Subscriptions that let you get from 25 and up to 500 downloads a month -starting at only $35 monthly-, to our popular 99club deal that gives you 200 downloads per year at only $99, going through our other Annual Plans for great discounts on yearly download limits, and our image packs to buy all the images you want at once, no strings attached. You will find awesome prices and options for your every image needs! All of our plans include downloads of any size, up to XXL, perfect for all kinds of design purposes. We have a library with over 4 Million high quality images and illustrations, all Royalty Free and suitable for commercial use. Don't hesitate and visit StockPhotoSecrets Shop today to get amazing and cheap stock photos! You can find more details on our service in our new Monthly Subscriptions coverage article. For more info on our amazing yearly deal, read our 99club review. One of the top stock photo agencies in the market is Shutterstock, and they've well earned that spot. One of the first companies in selling Royalty Free photos online, they are the inventors of the stock photo subscription, and that is still their core offer: hundreds of images every month, costing only cents each. Now they have different volume options to better serve small budgets, letting you get from 10 and up to 750 photos per month, starting at only $49 monthly. They also have image packs to buy on demand. Learn all about Shutterstock pricing here. Shutterstock has the largest online photo library, with well over 100 Million photos, vectors and illustrations to pick from. They add an intelligent search function and a free image editor among other perks that makes them as useful as affordable. Of course, all their photos are Royalty Free and you can use them in commercial projects, and they come in high resolution at no added cost with subscriptions. Sign up for free at Shutterstock here! But wait: Save more buying photos with our great Shutterstock Coupon Code for 15% Off! More on this agency? Read our Shutterstock review. 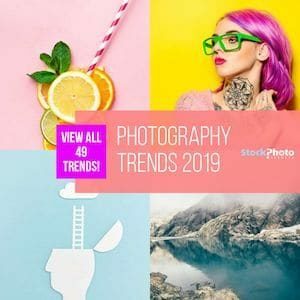 A younger but still reputable and very popular option is Adobe Stock, a stock photo service by Adobe that includes images from stock photo agency Fotolia (owned by Adobe as well). The core value in this service is that it's fully integrated to Creative Cloud platform, making it ideal for users of Adobe's cloud applications. It lets you search, test edit, license and use stock photos in your work without every leaving your favorite design app's interface. It certainly saves you a lot of time and effort. 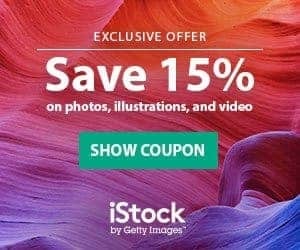 Adobe Stock offers monthly and yearly subscriptions, from 3 and up to 750 downloads per month, starting at just $29,99 monthly. They also sell photos on demand, at $9,99 each. They have a varied collection with over 60 Million images both from Fotolia's library and from direct contributions, all in high quality at no added cost, and Royalty Free. They include intelligent image search, resulting in a very complete and useful service for designers and creatives using any of Creative Cloud's applications. If you want to have this service, sign up for free with Adobe Stock now! And if you want to test them without spending, don't miss the chance for this Adobe Stock Free Trial! For more details on this service visit our Adobe Stock review. The pioneer online stock photo agency and one of the main ones in the industry, iStock is famous for their wide selection of exclusive content: photos you will only find at their library, with higher production value and uniqueness, that come at a higher price. They complete their offer with a huge pool of images that, while still great and very useful, are not exclusive and therefore are more affordable. This makes a library of millions of photos to choose from, according to your needs. Know all about iStock Collections here. iStock offers images on demand with credits, ranging between $8 and $33 each, and subscriptions for either just non-exclusive, or for the entire catalog. Of course, plans for non-exclusive downloads only are cheaper. They also have options for monthly and annual plans, from 10 and up to 750 images. Prices start at $40 per month. The level of curation of content, and the millions of exclusive, high value photos, mark the difference in iStock's service. All images are Royalty Free, and they come in high res at no added cost. Plus, iStock is backed up by their parent company Getty Images, nothing more and nothing less than the most renowned stock photo agency in the world. If you want to get exclusive imagery for your designs, sign up for free at iStock today! And to save some bucks in your purchase, use our special iStock Promo Code with up to 15% Off! More about this agency in our iStock review. A very well established stock photo agency, Depositphotos has a wide offer in stock photos for every budget. They have over 50 Million photos, vectors and illustrations available for download, and a very good customer service. Adding perks like a free files section (that you can access by signing up as a member), their price range and quality of content make them a great choice to buy cheap stock photos. Plus, all their files are Royalty Free. This agency sells images on demand with image packs, letting you get from 10 and up to 100 downloads paid in advance to be used whenever, without further commitments and at very reasonable price. Their subscription options are wide, and their latest addition is a Flexible Plan, which gives you 10 images per month and includes rollover of unused downloads and extra photos at discount price. You can get this plan for $9,99 a month, or $99 a year. There's also subscriptions for 75 and up to 750 downloads per month, that you can hire monthly or annually. Yearly plans are billed only once instead of monthly, and they offer a better price deal of course. Priced from $69 for monthly plans to $1999 with the biggest yearly deal, you have options for any budget. Depositphotos is well known for their customer service, they put a lot of effort in better serving their clients. Besides their nice free photo section, you will also find they have a useful search engine that includes reverse image search, letting you find stock photos that are similar to any image you provide. Certainly a very good service, very affordable and reliable. Worth trying! If you're ready to get their photos now, sign up for free at Depositphotos! And don't miss the chance to get more value for your money with our special Depositphotos Offer + 5 free Credits! Want to know more about this company? Find it in our Depositphotos review. With years in business a very respectable position amongst the top companies in the space, Dreamstime is a stock photo agency with a very good deal in cheap, high quality images. They offer a library with over 57 Million photos, vectors and illustrations, all Royalty Free. You can buy Dreamstime images using credits, that let you purchase photos one by one, paying as you go. Image price varies according to how well each of them has sold so far, the size of the file, and the size of credit pack you use, ranging from $0.77 to $14,63. They include subscription plans too, although a bit more narrow. You can get 5, 10 or 750 images per month. From 10 images and up you can go for a yearly plan as well. Starting at only $25, these are great deals to get images cheap. At their website you will also find a free photo section, with files available for download and use free of charge. The only requirement to access this resource is to be registered as member on their platform. This adds to an already very good offer, with cheap prices and wide variety of content, making Dreamstime a very reasonable option to get professional images. To start downloading great photos, sign up for free at Dreamstime today! Learn more about them in our Dreamstime review. Well established in the market since years, 123RF is a stock photo agency part of the top 10 of companies in the industry. They have a very good service in stock photos, offering them a large collection of almost 75 Million Royalty Free images at very affordable prices and with interesting bonus benefits. Their history and pricing grants you to get cheap and high quality photos in a trustworthy deal, suitable for all kinds of budgets. They sell photos on demand with credits, and all their images are priced according to size and usage (web and print). Depending on the credit pack you have, photos can cost from $0.81 to $9.70 each. They also have subscription plans for 150, 200 or 750 downloads per month, that you can hire for 1 month, 3 months or 1 year. Of course, the longer your plan is, the less the cost of each image is. Plus, their smallest subscription comes with daily download limit of 5 images, but the rest of them have no daily cap. Starting at just $59 per month, this is a great way to get lots of images cheap. 123RF doesn't stop at good prices for stock photos. They also have a free photo section, full of content you can download and use for free, as long as you have an account with them. Their search engine has intelligent technology to ease the finding of the right photo. And they include an online photo editor for you to customize your images even before downloading them. As you see, 123RF service is very complete, and comes at a very low cost. If you want to explore their collection, sign up for free at 123RF right now! And if you want to save money, use our special 123RF Coupon Code for up to 20% Off! To know more about this agency, check our 123RF review. PixelRockstar is an excellent stock photo plugin and service for WordPress online publishers, that brings a collection of over 4 Million high quality stock photos directly into their WordPress layout, ready to be used in their articles with a few simple clicks. This service saves time, effort and money in adding compelling imagery to any publication and its supporting material, making it an awesome resource for online publishers around the world. The service comes in the form of a WordPress plugin that adds a dedicated button on your WordPress board. This button launches PixelRockstar's catalog of millions of images, where you can browse or search for the one that represents your vision. With a couple clicks of your mouse you can select, license and add the images to your blog post, without any further actions! Even better, you can also use the same images for newsletters, and even social media posts, to support your article. PixelRockstar's custom Digital License covers all the usage needs of online publishing, and the whole service is specifically designed for this use. You can buy the images via different image packs, for 10, 50 or 350 images. With a base price of only $9, there's no budget restrictions to access this great deal. Saving you the hassle of searching and buying images at a stock agency to then import them into WordPress media library, and granting image quality, usage coverage and affordable pricing, PixelRockstar is the perfect companion for WordPress publishers. If you want to experience the service, get PixelRockstar today! Would you want to have more details on this offer? Read our PixelRockstar review. Vectorfresh is a vector-only stock site with a great service for graphic designers. They have a catalog with over 1 Million Royalty Free vector files ready to download and use in any commercial or personal project you like. Their prices are super low, and they offer a very complete set of features for easing design work. They work with an annual subscription that gives you 100 downloads per month (a total of 1,200 vectors per year). The original price for this plan is of $109, but they are currently running an awesome early bird offer where you get this deal for only $49! That's about $0.04 per vector! The library is varied and carefully curated, and all vectors include EPS file so are fully customizable without losing image quality. As said, a great deal for graphic designers to find the right complements for their work without breaking the bank. Want to seize the early bird offer? Get your Vectorfresh membership right now! If you are looking for icons for your interface designs, Icontail is the right stock agency for you. Specialized in vector icons, this company offers you a very good service in the form of a vector icon pack that covers all of your needs at once. Icontail gives you a huge pack of over 2000 vector icons, including line and fill, covering 50 categories and all optimized for iOS and Android. You can buy the pack once, and use the icons in as many projects as you want, including those with commercial intentions. The price is great, and you have two options, depending on how many file formats you want to have at your disposal. The standard pack including AI and EPS files is only $59, and you can opt for the premium pack with 8 different formats for $79. In both cases you get access to the whole collection of over 2000 vector icons! If you want to secure icons for all your possible designs at once, get Icontail today! Now you know stock photo agencies are companies dedicated to collect professional, high quality photos and to sell the usage rights for them, commonly at very low prices. This makes them a great resource to get the images you want and need to make your designs stand out, without spending thousands of dollars. At any of the Top 10 Stock Photo Agencies listed above, you will find great photos at affordable prices, under Royalty Free license which gives you wide flexibility in usage. What are you waiting for? Explore the list, find the right match for you, and start downloading awesome content for your work! The StockPhotoSecrets Shop is a stock photo agency developed by industry veteran Amos Struck and his team, though specifically for small and medium-sized businesses. It aims at providing stock photo solutions to their image needs, that fit in everyone’s budget. It offers Royalty Free stock images on demand with image packs for between $5,95 and $7,80 depending on volume. And amazing annual subscriptions like the 99club offer and Low Volume Deal which give you images for as little as $0,33 and $0,49 each with no monthly limits and great benefits. If you run a small business or are a freelancer working on a restrictive budget, this is definitely an agency worth knowing and using.